Three of the exams were were administered at the 2009, 2010 and 2011 S. Colorado Regional Competitions. The remaining two were administered at 2015 and 1016 Illinois Regionals. Images have been substituted for actual specimens in four of the five exams. An activity addressing the Law of Superposition has also been included. Same exams and activity as described above to download to your inbox via High Tail It within 1 to 2 days of purchase. No additional fees or shipping charges apply. Featuring Safari® Models, among the most accurate ever manufactured, plus actual mammoth hair, pieces of mammoth tusk and bones. Students are presented with a unique opportunity to actively explore the adaptations, life styles and former lives of these fascinating creatures. Extinction, comparative anatomy, modes of life, climate change, environmental adaptations for survival within the harshest of environments, and more … take on an uncanny realism as students become engaged in this hands-on unit. Paleontological concepts acquired during this unit readily transfer to studies of other ancient creatures known only from the fossil record. Kit includes wooly mammoth, African elephant, Asian elephant, and Smilodon Safari® models. Eleven lessons, with keys, are included on a CD. This kit includes either a sea star or brittle star, crinoid stem, crinoid holdfast, several representative sea urchins, pentremite thecae, and a sand dollar plus several highly interactive lab units on CD. 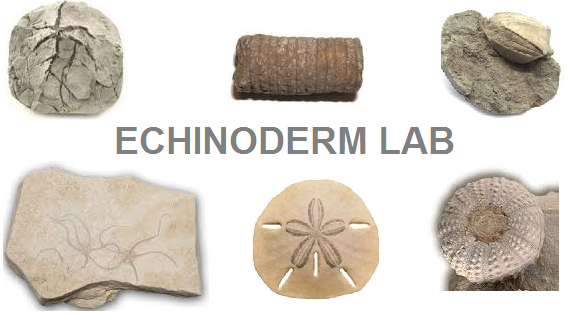 This unit provides an in-depth study to assist participants in developing a basic under-standing of the echinoderms included on the NSO Fossil List. 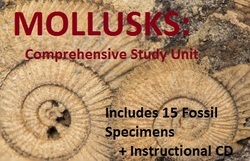 This unit provides an in-depth, hands-on introduction to a majority of the mollusks included on the Official NSO Fossil List. Ammonite (four specimens), Baculite body segment, Belemnite guard, clam, Conus, Graphaea, Orthoceras, Pecten, a straight-shelled Nautilus, an extant 'cut-away' Nautilus, Turritella and Worthenia. A Whelk has been included to help reinforce the strategy of transferring existing knowledge and expertise to other members of the same phylum. Paleontological concepts acquired through participation in this unit enhance studies of other ancient creatures as well. Nine lessons, plus student response sheets and answer keys have been included on a CD. This unit provides an in-depth, hands-on introduction to three of the five trilobites on the official NSO Fossil List - Calymene, two Elrathia kingii (one, an original with cheeks and a second, a molt without cheeks), and Phacops. Knowledge gained through the study of the three trilobites included in this kit is appliable to all trilobites. Four lessons, response sheets and answer keys have been included on a CD. 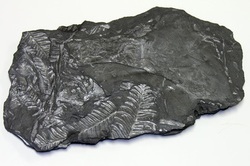 WISHING TO PURCHASE INDIVIDUAL FOSSIL SPECIMENS? Please return to the Website Menu, click on "Shop", and choose the 'Fossils' option. Our goal is to create additional study units for most animal phyla within the next several years. Please consider entering our web address into your favorite places so you may easily check the availability of future products. We would also appreciate your sharing information about our website and the quality of our products with friends and colleagues. Several fossils included within our Exploratory Kits are sometimes difficult to obtain. 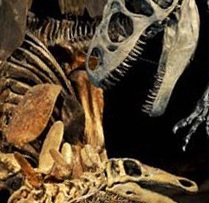 In the event one or more of these fossils are not available when assembling the kits, substitutions may be made. 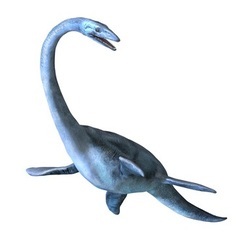 If or when this occurs, substitutions of fossil specimens may also involve minor revisions within the text of the units. Our Exploratory Units are a relatively new undertaking. For those who purchase and use one or more of these units, we would welcome your input as to their quality and effectiveness with students. We also welcome you to share any suggestions you may have for us to consider as we develop future units. Thank-you in advance for your input. As a highly satisfied purchaser of Mr. Winter's fossil specimens, I'd like to share that he was kind enough to assemble the best possible specimens for us based on our limited budget. Being able to work with specimens of such high quality motivated our kids to perform at their very best. These fossils are absolutely beautiful! To offer an outstanding experience, as well as a year-long learning opportunity for our students, we purchased a large number of reasonably priced fossils from Other Worlds. We also purchased the Mollusk, Echinoderm and Trilobite Exploratory Units which include large, excellent fossils. I recommend skipping the tiny fragments included in most other "kits" as those from Other Worlds are among the very best! Our kids LOVED the fossils specimens we purchased from you. In fact, two kids were so inspired that they decided to leap in and cram for the Regional test. Your Exploratory Units really help a coach understand how to break down the concepts for young students. They get so much more out of it! "First, let me express the pleasure I experienced as I opened the box and removed the packs of each fossil one by one. It was amazing! I felt a little like I was out collecting in some ideal spot that had everything imaginable. I am impressed with the overall quality of the specimens. They'll be a great addition to our little Nature Center here in Stockton. I'll also be using them for the local Science Olympiad." Name of school and coach withheld upon request.